The U.S. Department of Commerce recognized Phoenix Contact for its positive investment in the United States, leading to job creation and economic growth. 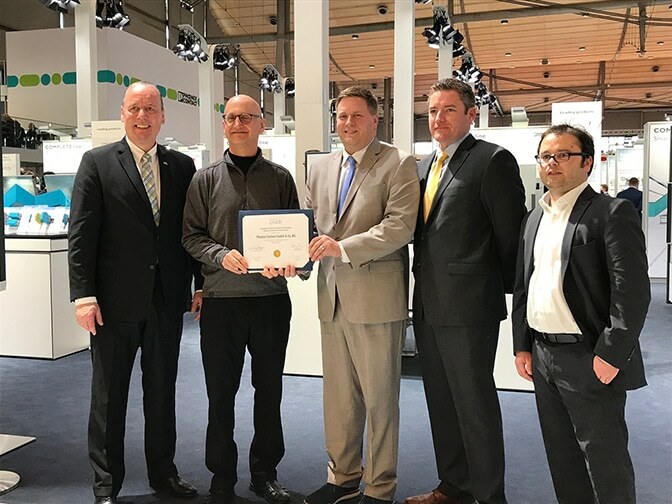 Ian Steff, deputy assistant secretary for manufacturing at the U.S. Department of Commerce, and Brian Lenihan, executive director for Select USA, presented a certificate to Phoenix Contact executives at the Hannover Messe in Hannover, Germany, on April 2. Phoenix Contact is a leading manufacturer of automation, control, power, and connectivity products, with global headquarters in Blomberg, Germany. The company established a U.S. subsidiary in 1981. Today, the company employs more than 800 people in the U.S., including more than 600 at its U.S. headquarters, located just outside of Harrisburg, Pa. The Pennsylvania site encompasses more than 360,000 square feet and includes development, manufacturing, sales, support services, and a logistics center serving North and South America. Pictured left to right: Frank Stührenberg, CEO of Phoenix Contact; Jack Nehlig, president of Phoenix Contact USA; Ian Steff, deputy assistant secretary for manufacturing at the U.S. Department of Commerce; Brian Lenihan, executive director for Select USA; and David Moock, authorized investment representative for the Pennsylvania Department of Community & Economic Development’s Office of International Business Development.